Reminiscing about the classic cartoons from the heyday of Saturday morning television hasn’t lost its luster even two decades on, and the ongoing revival of such popular properties as My Little Pony, Transformers, and Teenage Mutant Ninja Turtles means that being a child of the '80s is still totally rad, bro. But even amidst the seemingly never-ending parade of '80s paraphernalia, some properties have been forgotten—like the transformative charms of the Popples. Stars of a short-lived '80s cartoon, the Popples were a toy first—a toy that’s basically just a stuffed bear with a long tail that’s able to roll itself up into a ball thanks to a pouch on their backs that also doubles as a portal into an extradimensional void known as “hammerspace.” Brilliant, weird, and totally cute. While the Popple brand eventually expanded to include Babies (they had rattles in their tails), tiny Pufflings (who communicated via squeaking only), and Sports Popples (which ingenuously turned into balls modeled after the sport they repped), the original Popples remain the most iconic and the most adorably '80s of the fuzzy group. One of the de facto leaders of the Popples, the surprisingly sensible PC still lived up to his name in just about every way possible. 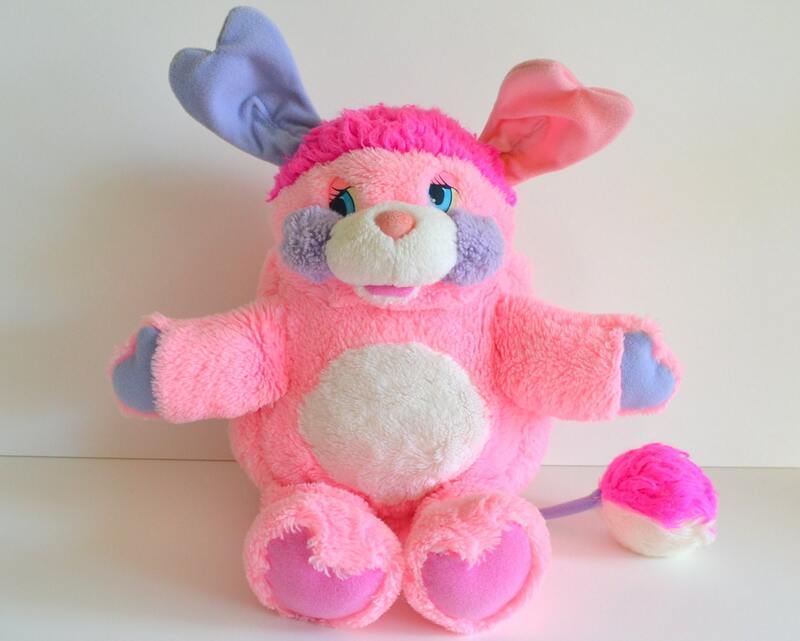 A larger Popple, his color combo (blue and pink with contrasting orange and yellow ears) was one of the most classic Popple looks, and while we’re not entirely sure, his colorful zing probably had a little something to do with his magic touch—PC could actually make flowers bloom with a magic finger snap. Maybe that’s why he was something of a ladies’ man (you read that right). If PC was the cool-headed portion of the Popple leadership, Party was the hot-headed half. Prone to, well, partying, Party would routinely pull confetti and party hats out of her pouch and try to get everyone else to get down. Dazzling in both size (like PC, she was a large Popple) and color (her pink and white combo scream “lady!”), Party was a ball of fun—even when she was dueling with Prize for PC’s affection (drama). The sweetest of all the Popples (and especially of the large-sized ones—she was the final member of the trio), Pancake was the Popple you turned to when you were feeling down. She’d tickle you with her tail, say the right things to pep you up, and soothe you with her unique green tummy. While you’d be tempted to think that all Popples were super-silly (again, they are oddly-colored bear things that fold into balls), Puzzle took the cake when it came to jokes, pranks, and all-around goofiness. But the medium-sized Popple contained multitudes—he also loved to read and was an accomplished swimmer. Don’t ever try to pigeonhole Popples, pal. The third piece of the PC-Party love triangle, medium-sized Prize was the vainest of all the fuzzballs (that bright blue tummy was something to be admired, admittedly). Often found looking in a mirror, speaking in a Marilyn Monroe-styled voice, and dreaming about a career in film, Prize was definitely the most look-obsessed Popple in the bunch, but she also loved telling jokes and fun stories. Saddled with snowy white fur she was obsessed with keeping clean, it’s no wonder that Puffball developed a talent that allowed her to stay still for long periods of time. The last of the medium-sized trio, Puffball was—get this—a skilled ventriloquist. One of the tiniest of the original Popples, Pretty Bit was also quite pretty and just plain bitsy (just look at her tiny little mismatched ears!). Shy but loyal, the very polite and poetry-loving Popple often amused her pals by speaking in rhyme. You’ll never guess what Potato Chip Popple was known for. Imitating sounds just like Police Academy’s Michael Winslow! Okay, fine, Potato Chip Popple was best known for her big appetite for all kinds of snacks (all the more impressive, given her small size), but she also demonstrated some nifty sound effects skills, presumably when her little mouth wasn’t crammed with yummy snacks. A trickster like Puzzle, Putter Popple was the most hyperactive of the group, frequently zinging about on his quest to make more (often somewhat ill-fated) inventions. The little green guy was the only boy in the small Popple group, but he didn’t let Potato Chip or Pretty Bit take center stage—he ended up appearing in more episodes than those two put together. While the original nine Popples belonged to cute kiddos Bonnie and Billy Wagner (who thought they were the only ones with such amazing toys), both the Wagners and their Popple pack learned the truth when Mike and Penny moved into the neighborhood, toting their own Popples. That crew included a punk rock duo—this was the '80s, people—of which Punkity Popple was the male half. A kitted out medium-sized Popple, Punkity sported both an earring and a lightning bolt on his pink tummy. The lady side of the punk rock Popple duo, Punkster was medium-sized just like Punkity, and her look was punctuated with a Cyndi Lauper-inspired hairdo and a star on her tummy. Punkity also played the tambourine, which is about as punk rock Popple as it gets.